Frequently digital cameras use a cryptic format for saving photos, but without any description. For example the files like images or videos saved from the Internet are the same. With Panda Batch Renamer File you can rename music, photos and general files due to its intuitive interface. You can add files with the browser or from clipboard and then shown with original final file name, file name and the folder path. 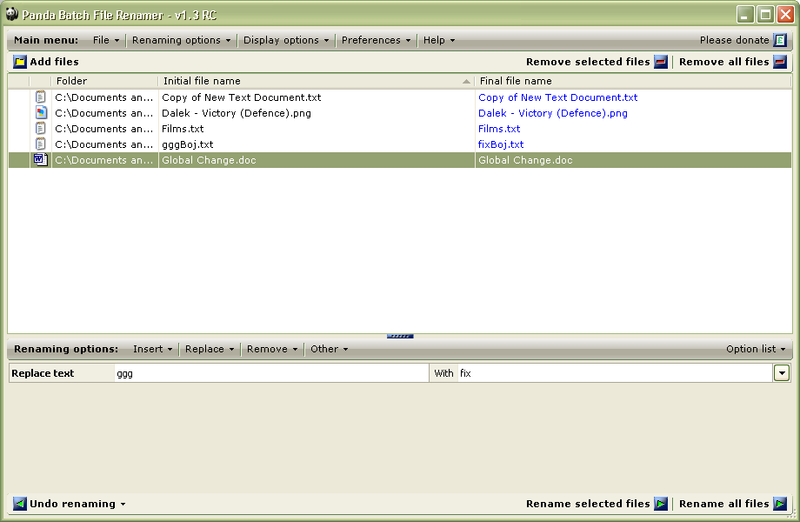 The options displayed by the menu gives the possibility to remove and add features from the table. The program will renew the final file name each time renaming options are edited, added or removed. There are four pulldowns: Indert, Remove, Replace and Other. You have the possibility to add, remove or replace text but also to update information from meta tags. Various renaming options can be made and positioned. You can operate drag and drop. With Insert menu you can choose locations for every renaming option. Every change is automatically displayed and after can be used for certifying the changes immediately. Panda Batch Renamer File gives the possibility for saving renaming patterns so they can be use later. It is a very interesting and unique application because of the ability of utilizing file meta tags and the capacity to keep renaming patterns. Thanks. I updated the link from the article.